NEW WESTMINSTER, BC – Steel & Oak Brewing has announced details of the latest release in its Brewers Series of bottle conditioned beers that feature “some really unique styles on a small scale”, and serve as “a vehicle for our brewers to experiment with new ingredients”. Cascading loaves of beautiful rye, buckwheat, and whole wheat sourdough bread from Solodko Bakery in New West went into the mash of this Kvass inspired beer. Khlib is fermented with a Belgian yeast strain and has notes of toast, spice and fruit. 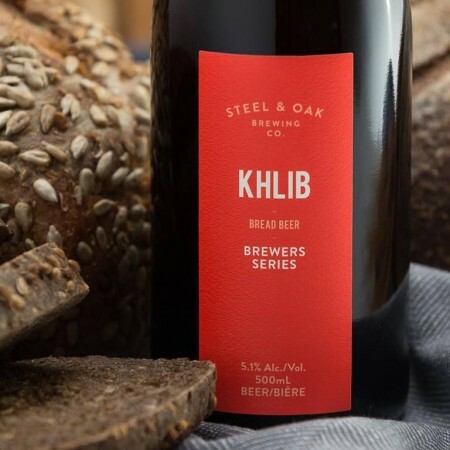 Khlib is launching today in a limited run of 500 ml bottles at the Steel & Oak tasting room and store, and will be available soon at select private liquor stores around Metro Vancouver.